eeek! I did a steek! 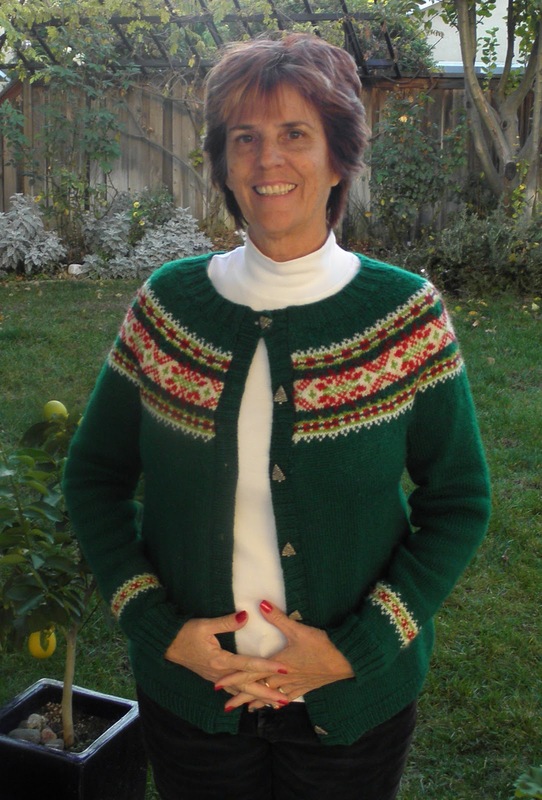 Every Winter I wish that I had knitted a Christmas sweater. This summer I started one. I did the majority of the boring mindless knitting in the hot summer months and this Fall I began the Fair Isle yoke. 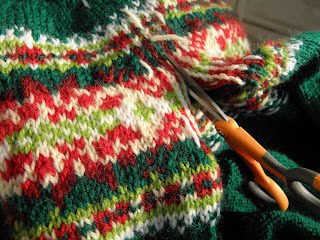 Knitting a bottom up sweater in the round makes Fair Isle knitting fast and fun. But I like cardigans, this required cutting the thing up the front. It's called steeking. 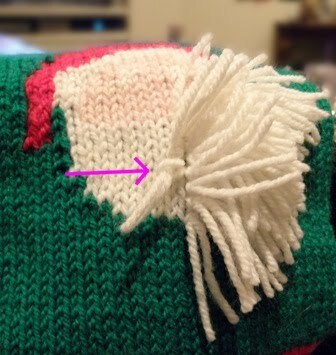 Whenever I talk about steeking it strikes fear in the average knitter. Well I'm here to tell you that it wasn't all that scary! 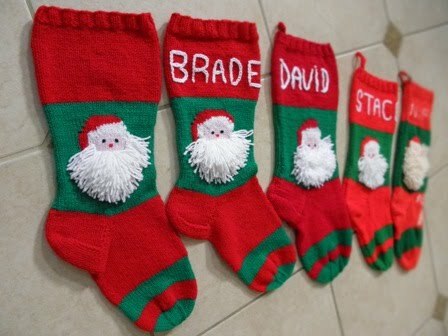 On the right you see me with most of the knitting done. 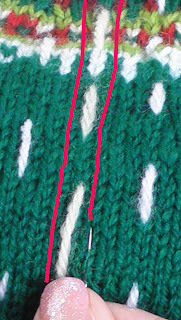 Next I needed to make teenie tiny stitches with a needle and thread (two rows of them) up the column of stitches next to where I would cut the steek stitches. I marked them in pink in the photo below. I even held the video camera in one hand and cut with the other. Ta Daaaa!!!! 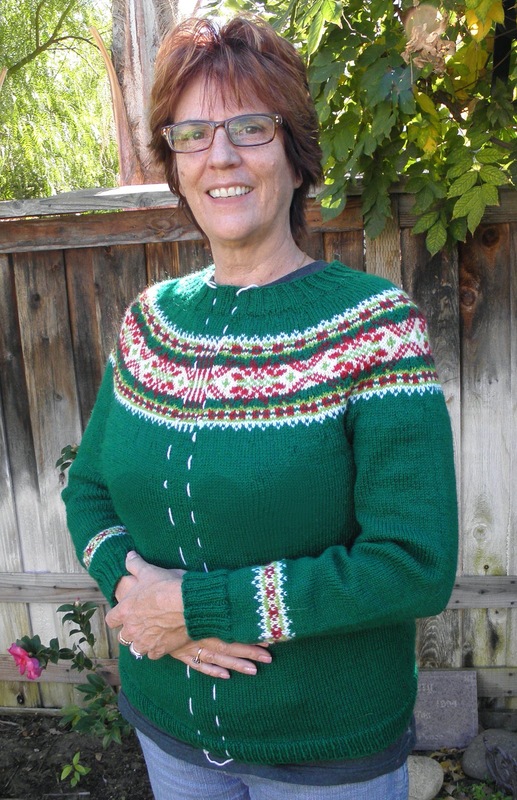 After picking up stitches all along the folded cut edge for the ribbed button band and sewing on the pewter Christmas tree buttons I now have the sweater I imagined. yarn: Brown Sheep "Nature Spun DK"
Each year I have hosted two retreats since 2009. I have to say that the June retreat this year was the best so far. We had so much fun. I taught two classes. Attendees learned to make a new sock heel and several cast-on and bind-offs. We felt like we were a million miles from home. 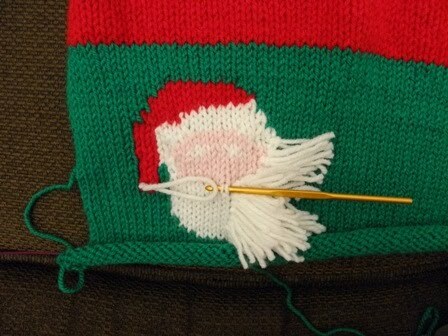 There was lots of knitting, eating and a little imbibing too. I think you can see for yourself in the following photos. There was lots of eating separated by lots of knitting. There was a patriotic theme in the dining room. Geri is looking rather festive! This is our comfy classroom. We can spread out and leave our knitting there all weekend. Katie brought her sewing machine and whipped out a couple of project bags! 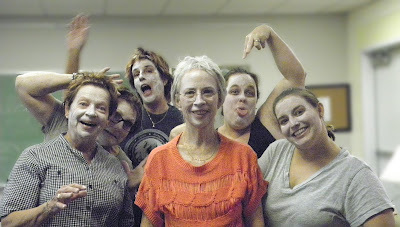 Katie also brought facials and we had koo-koo crazy fun! These are the fresh scones they brought to our room to tide us over before 10:00am brunch! We took a walk to the classroom where there were needlepointers! Geri was getting a massage and missed the group photo. Clockwise from top: Nancy, Laura, Katie, Kim, Karen. I hope you can attend a retreat. Find out more info about the October retreat here. The weather will be cooler and the view of wine country is spectacular. Join us for a get-away that is grown-up girl fun! 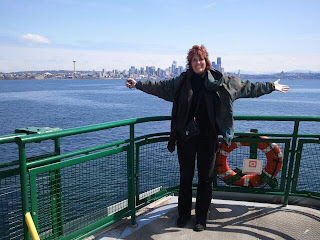 I went to Seattle with my knitting friends. 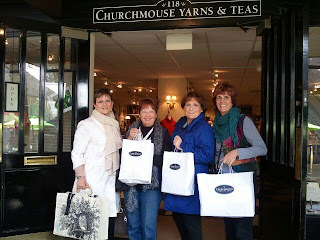 Lori is from Seattle and the last time she went for a visit she raved about Churchmouse Yarns and Teas on Bainbridge Island. The four of us decided to take a visit. Lori's fabulous parents, Hal and Mimi generously offered their lovely home, this afforded us more funds for yarn shopping! Before we move on to the yarn shop. These are the tulip fields that we visited. The view was spectacular. If you ever have a chance to travel to the Seattle area in April. do NOT miss this glorious sight with acres and acres of tulips! 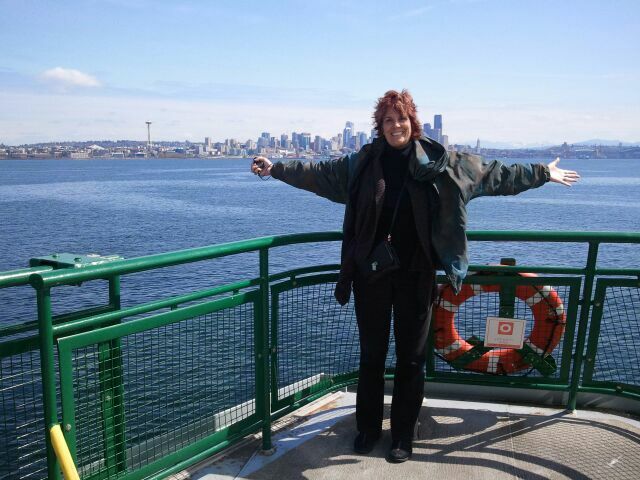 Another day, a car ride on the ferry to Bainbridge Island. We visited this shop twice in 24 hours. As you can see we found lots of goodies to buy. I have to say that of all the shops I have been to....and there have been many....this is by far my favorite. The staff is warm and knowledgeable. The decor and layout of the store is impeccable. Think Anthropology as a yarn shop. A few pictures are worth more than any words I can offer. Can you see me in this picture? so..a few knitters look like grandma. Churchmouse has it's own line of patterns and are beautifully photographed by Jarod Flood. Visit their web site to get a little taste of their fabulousness. I would love to make this an annual event. The tulips fields and Churchmouse are alone worth the trip. What makes a wonderful vacation is the company. 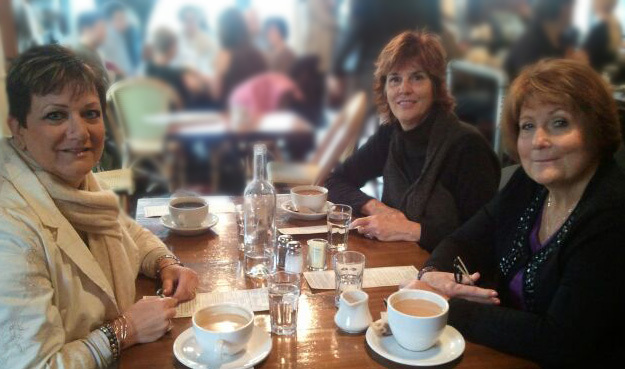 I have been knitting with these pals for years and it was so fun to get away and take and adventure with them. Knitting in our pajamas, finding enough outlets for all of our ipad/telephones, laughing like girls, eating and shopping. An ideal getaway I highly recommend it! 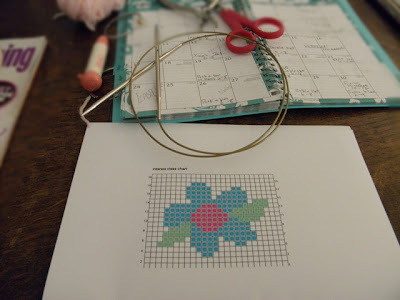 Most charts have squares yet a knit stitch is really wider than it is tall. Can you see the difference? This swatch is still a hot mess. It will look better once I weave in the tails which will take away those holes you see. A little drench in water and look at how fabulous it is! Getting knitting wet is a way of making the stitches sing Kumbaya, getting together to make your project look crisp and beautiful! the back! 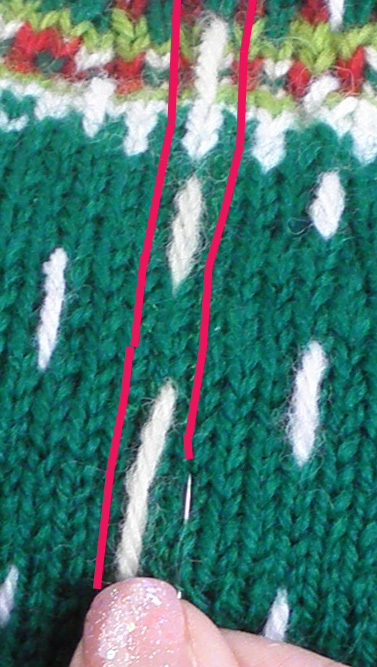 I have found a needle that is perfect for weaving in tails. 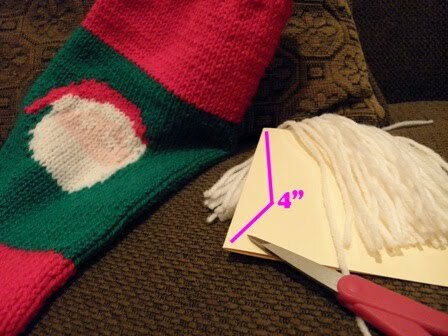 It is called a chenille needle. It's big enough to use with yarn with a very sharp point that allows you to split the ply and bury your tails for a perfect finish! 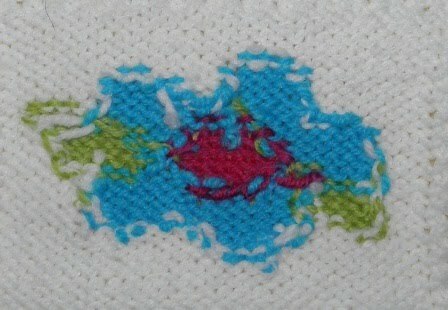 I'm going to teach a class on Intarsia in May. Since Spring is all sprongy around here I thought we'd all make a flower. 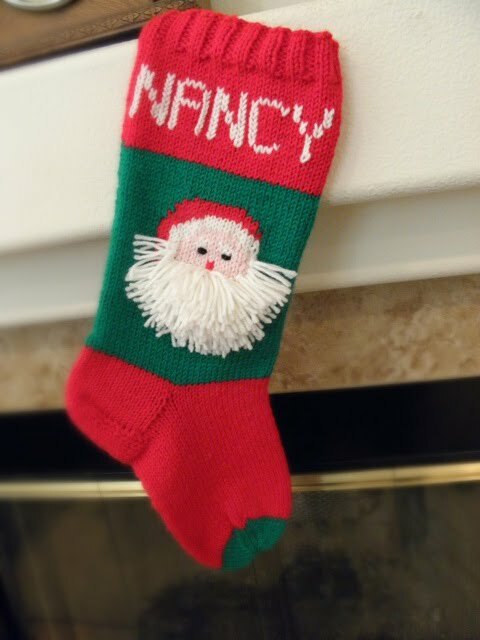 In a couple of days I'll knit this pretty poesy up and show ya'll.